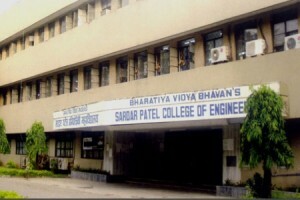 Bharatiya Vidya Bhavanâ€™s Sardar Patel College of Engineering (SPCE) was established in 1962 as a Government Aided Engineering College. It was started with three conventional courses. viz., Civil, Electrical and Mechanical with an intake of 40 in each branch which was subsequently increased to 60. The institute is permanently affiliated to University of Mumbai. SPCE was the only institute offering four year Part Time (Evening) Degree Courses in Civil, Electrical and Mechanical branches to encourage serving diploma engineers to improve their qualifications and update their knowledge. The next stage in development aimed at raising the level of the institute to Post Graduate by starting Post Graduate Course in Civil and Mechanical. The institute introduced first P. G. course namely M.E. (Civil) with Structural Engineering Subjects in the year 1988 with the aid from Ministry of Human Resources Development (MHRD), Government of India. Subsequently Post Graduate Program in Mechanical Engineering disciplines was also introduced. Over the last 50 years the college has gained an excellent reputation in the field of Technical Education. S.P.C.E. Grade â€œAâ€ rating engineering college from Govt. of Maharashtra has maintained a proud tradition of excellent academic records by securing high ranks, gold medals and other awards in the University Exams. The college has produced many graduates and Post-graduate Engineers, many of our past students are now leaders in their professions. S.P.C.E. Alumni can be found in all public and private sector organizations operating in diverse fields, often holding senior and key positions in the organization. Notwithstanding what is stated above, candidates who have passed the section And section examination conducted by the Institutoin of Engineers (India)-Calcutta 700 020, and qualified at the GATE examination conducted by the I.I.T.’s will also be deemed eligible for admission to the Master of Engineering course in the specific branch in which they have passed section And and section B examination of a related branch as listed above. 3. A candidate of M.E. degree course may appear for semester I examination after satisfactory completion of coursework for semester I, semester II examination after satisfactory completion of coursework for semester II, semester III examination afer satisfactory completion of literature review and some part of dissertation work and semester IV examination after satisfactory completion of dissertation work. 4. To pass the M.E. Degree examination, candidate must obtain at least 50 percent of the marks obtainable in each subject’s in-semester tests, end semester test and internal assessment taken together and 45% marks in end semester test for semesters i & ii and 50 percent of the marks obtainable in each seminar on dissertation topic, dissertation and viva-voce examinations for semesters III and IV. Those of the candidates who fail to obtain, 50 percent marks in any of the subjects of semester I and/or semester II shall reappear only in that subject/subjects paper which will be of 100 marks and the internal assessment marks of that subject/subjects shall be carried over. Those of the candidates who fail to obtain, 50 percent marks in any of the seminars and/or dissertation and viva-voce examinations of semester III shall improve upon by reappearing in in those seminars and/or dissertation and viva-voce examinations. 5. In order to be eligible for a class, candidate must appear and pass the first and second semester examinations in not more than four consecutive semesters after registration with a proviso that each subject has to be cleared in not more than two sittings. Further, the candidate shall submit the dissertation before the end of sixth semester after registration. In case a candidate is unable to submit the dissertation by the end of fourth semester, he/she shall apply in advance with the recommendation of the supervisor and concerned department Head, to the examination committee for the extension of maximum six months at a time. 6. No candidate shall be allowed to attend the semester II course unless he/she has satisfactorily kept the terms for semester I, and ao attend seeser III unless he/she has satisfactorily kept the terms for semester II. Further, no candidate shall be allowed to appear for the dissertation and viva-voce examination unless he/she has satisfactorily kept terms for semester I to IV and passed fully in semester I, II and III examinations. 7. Those of the candidates who obtain 50 percent of the total marks obtainable in each subjects and 50 percent marks on the aggregate of the marks assigned to each semester separately, shall be declared to have passed the semester I, II, III or IV examinations as the case may be. 8. A candidate who fails in an examination but secures 50 per cent or more of the total marks in any subject tests and internal assessment taken together may, at his/her option, be exempted from reappearing for the same at a subsequent attempt, and will be declared to have passed the relevant semester examination when he/she has passed in the remaining subjects. The evaluation for the internal assessment will be carried over to the subsequent examinations and will be considered along with the marks for in-semester and end semester tests for the award of a class. 9. A candidate passing any subject in more than one attempt shall not be considered eligible for a prize or scholarship to be awarded. 10. The Term Work and seminar of the internal assessment for any subject shall be assessed by the teacher concerned on a continual basis based on home work assignments, in-class assignments, design & drawing work, report on experiments conducted etc., The Head of the department will forward the consolidated marklist of internal assessment of all the subjects of semester I or II to the examination section. The seminars on the dissertation topic will be conducted on the dates decided by the Principal or the Controller of Examination and shall be evaluated jointly by the concerned supervisor and one internal examiner. The internal examiner will be decided by the concerned Head of the department. The dissertation report shall be submitted to the examination section in a typed and spiral bound form and it shall be assessed jointly by the concerned supervisor and an external examiner appointed by the examination committee. The candidate shall submit the hard bound copy of the dissertation report after incorporating corrections if any to the concerned Head of the department. 11. A candidate must complete the entire course successfully within the span of five academic years from the date of registration for the course failing which the candidate shall have to register a fresh. If a candidate has to discontinue his/her studies due to some reasons, he/she can reregister himself/herself within five years from the date of registration. A candidate who passes in all the heads of passing in the examination without the benefit of either gracing or condonation rules and whose total number of marks falls short for securing Second Class / Higher Second Class is less than 1% of total or up to 10 marks, whichever is less, shall be given the required marks to get the next higher class or grade as the case may be. Provided further that benefits of above mentioned grace marks shall be given to the Candidate for such examinations only for which provision of class has been prescribed. (Only for T.E / B.E). If a candidate fails in only one head of passing, having passed in all other heads of passing, his/her deficiency of marks in such head of passing may be condoned by not more than 1% of the aggregate marks of the examination or 10% of the total number of marks of that head of passing in which he/she is failing, whichever is less. However, condonation is restricted to maximum up to 10 marks only. Provided further that benefits of above condonation shall be given to the Candidate for such examinations only for which provision of marks has been prescribed (Only for T.E / B.E). Condonation of deficiency of marks be shown in the Statement of marks in the form of Asterisk and Ordinance number. In any case where it is found that the result of an examination has been affected by errors, the Controller of Examinations shall have power to amend such result in such manner as shall be in accordance with the true position and to make such declaration as is necessary, With the necessary approval of Principal, provided the Errors are reported/detected within 2 months from the date of declaration of results. Errors detected thereafter shall be placed before the Examination Committee. Error means- (i) Error in computer/data entry, printing or programming and the like. (ii) Clerical error, manual or machine, in totaling or entering of marks on Ledger/ register. (iii) Error due to negligence or oversight of examiner or any other person connected with evaluation, moderation and result preparation. ORDINANCE 5049: Appointment of Paper setters, Examiners, Senior Supervisors and conduct of examination etc. 1. No person can claim appointment as paper setter / examiner / or any other Examination work as a matter of right. Appointments of persons as paper setters / Examiners shall be ordinarily made at the time of End semester examination. 2. The paper setters/examiners/moderators shall not refuse to accept the assignment of the examination work. They shall also ensure that their availability for assignment is communicated to the examination section, in the prescribed time limit. If no communication is received within the prescribed time limit, it will be presumed that assignment is accepted by the paper setter / examiner. 3. The paper setters/examiners/moderators shall follow all the directions given by the Examination committee from time to time in respect of question papers, setting of question papers, Model answers, scheme of marking etc. 4. The Principal shall be the Chief Conductor for all the examinations. Whenever substitute arrangement is required it shall be done only by prior permission of the Principal. 5. Chief conductor shall ensure that the stationery required for the conduct of examinations, question papers, etc. are received at the examination centre. He shall also ensure that the packets of question papers are intact and duly sealed and are opened in his presence 20 minutes before the start of the examinations. 6. Invigilator shall ensure that the students are not resorting to unfair means / practices. In case incidences occur, he/she shall immediately report the cases of unfair means to the Controller of Examinations along with his report. 7. Immediately after the examination is over, dispatch the answer books should be dispatched to the CAP centre. 8. The CAP monitor appointed by the principal shall receive the bundles of answer books. 9. The director of the CAP shall arrange for the assessment of the answer books centrally as per central assessment programmed prescribed by the college. 10. The CAP monitor shall submit the mark lists to the Controller of Examinations as provided in the CAP scheme and as per the instructions received by the college from time to time. 11. As soon as the mark lists are received in the examination section the same should be processed immediately for preparation of result. 12. The results of the concerned examinations shall ordinarily be declared within the specified period as prescribed in Maharashtra Universities Act, 1994, and the result along with the statement of marks will be distributed to the concerned students. 13. The answer papers of examinations shall be preserved for a period of at least 12 months from the data of declaration of result of the examinations concerned. (a) On receipt of a report regarding use of unfair means by any student at any College examination, including breach of any of the rules laid down by the college authorities, for proper conduct of examination, Principal shall have power at any time to institute inquiry and to punish such unfair means or breach of the rules by exclusion of such student from any college examination or from any University course in a College either permanently or for a specified period, or by cancellation of the result of the student in the University examination for which the student appeared or by deprivation of any University Scholarship to him/her or by cancellation of the award of any University prize or medal to him/her or by imposition of fine or in any two or more of the aforesaid ways within a period of one year. (b) On receipt of report regarding malpractices used or lapses committed by any paper setter, examiner, moderator, referee, teacher or any other person connected with the conduct of examination held by the Colleges or Recognized Institution including breach of the rules laid down for proper conduct of examination, Principal shall have power at any time to institute inquiry and to punish such malpractices or lapses by declaring disqualified the concerned paper – setter, examiner, moderator, referee, teacher or any other person connected with the conduct of examination from any examination work either permanently or for a specified period or by referring his/her case to the concerned authorities for taking such disciplinary action as deemed fit as per the rules provided for or any two or more of the aforesaid ways. * Please note Part Time Degree courses have been discontinued from 2007.